Of mice and men: A battery of behavioral tests in mice can recapitulate behaviors similar to those seen in people with autism. There is strong evidence that autism has a genetic basis, and the field is making great strides in identifying autism candidate genes. As these findings accumulate, researchers need reliable methods to interpret them, including rodent models to assess the impact of genes on behavior. On 4 February, SFARI hosted a workshop to discuss the role of mouse models and behavioral assays in autism research. The participants concluded that the field should invest in techniques that can be standardized across laboratories — including how the mice are housed and tested, and which background strains are used. They also stressed the importance of mouse models for identifying biomarkers and testing therapies. Mice make strong animal models for human disease as they have a rich array of behaviors, a well-defined genome, and are easy to manipulate at the genetic and molecular level. Jacqueline Crawley, chief of the laboratory of behavioral neuroscience at the National Institute of Mental Health, noted in her talk that there will never be an “autistic mouse.” Instead, a good model should have sufficient construct validity — genetic or molecular similarity to hypothesized causes of autism — and sufficient face validity, meaning that the mice should show behaviors analogous to symptoms seen in people with autism. The ideal model is a mouse with a mutation in a gene implicated in autism that delivers insights about the molecular basis of the disorder and suggests targets for therapy. While geneticists are focusing on identifying candidate genes, behavioral neuroscientists are designing ways to test whether mice with mutations in risk genes for autism display behaviors with reasonable similarities to those of people with autism. These assays mostly center on the three diagnostic criteria for autism: impaired social interactions, language delays, insistence on sameness, and repetitive behavior. Mice generally interact using olfactory cues, or scents, and, to a lesser extent, touch. They are naturally social animals, and most experiments assay their level of interest in social interaction and whether they correctly show and interpret social cues. It is challenging to recapitulate the subtleties of human language in mice. However, they clearly communicate through the use of ultrasonic vocalizations, which can be tracked in social situations from birth to adulthood. Scent-marking behaviors — such as males responding to female pheromones by marking nearby territory with urine — may be another way to study complex communication in mice. Automated tracking of movement in their cages and quantifying obvious behaviors — such as grooming, digging, or spinning — can provide some measure of repetitive behaviors in mice. Tests for insistence on sameness, however, are more challenging. A number of potential assays have been proposed — for example, training a mouse to turn one direction in a maze and then measuring how easily they can learn to reverse direction, exploring only one object out of multiple new ones, or assaying whether mice in a cage with holes in the floor explore a few or all of them1. It remains to be seen whether any of these sufficiently recapitulate components of human behavior seen in autism. This is one domain for which increased collaboration with clinicians might be especially useful. People with autism often have associated traits, including seizures, abnormal sensory responses, anxiety, cognitive impairment, sleep disturbances and hyperactivity. Fortunately, there are many reliable assays for measuring these features in mice. Crawley also emphasized the importance of replicating findings in two groups of mice, and of using proper behavioral control experiments to avoid drawing incorrect conclusions and over-interpreting relevance to autism. Basic assessments of health, reflexes, senses and motor functions are critical to ensure that social deficits are not the result of unrelated factors2. Investigators must also be aware that mice are extremely sensitive to handling and to changes to their environment. Laurence Tecott, professor of psychiatry at the University of California, San Francisco, also noted that different strains of mice have different circadian rhythms, which affects their behavior and so can influence the outcome of behavioral assays. There are a number of mouse models based on candidate genes3, including two lacking SHANK3 — a gene responsible for organizing connections at synapses, the junctions between neurons. In one model, developed by Crawley and colleagues, males lacking one copy of the gene vocalize less than controls do in the presence of a female mouse, and have fewer social interactions. But, lack of SHANK3 has no effect on development, even in mice with no copies of the gene. A second model published a little more than a month after the workshop, shows more autism-like features, however — something the field has yet to resolve. The speakers also discussed strains of mice bred to be highly genetically similar — called inbred strains. For example, BTBR mice are not very social, have abnormal pup and adult ultrasonic vocalizations, and self-groom excessively, noted Valerie Bolivar, director of the Mouse Behavioral Phenotype Analysis Core at the Wadsworth Center, New York State Department of Health. By comparing BTBR genes to those from strains with more ‘normal’ behaviors, researchers hope to identify the genes that contribute to the autism-like behaviors seen in BTBR mice. David Threadgill, professor of genetics at North Carolina State University, also advocated for “hijacking” differences in mouse strains as a way to study mouse behavior. Threadgill cautioned that the usefulness of existing inbred strains is limited because they are genetically very similar to each other — approximately 40-50 percent of their genes are identical. Because of this, gene variants that might be relevant to human disease and occur naturally in the mouse population cannot be studied. Motivated partly by this confound, a large community of researchers has generated a new population of mice called the Collaborative Cross Line, bred from eight different strains, including three that are ‘wild,’ or not domesticated. These mice display genetic variation on par with that of the human population. Genetic variants, or alleles, have also been carefully tracked during breeding, so that each one is represented equally and its location is known. Because of this, more than 1,000,000 different lines can be bred from the Collaborative Cross Line, each with a reproducible and defined set of alleles. This tool will allow researchers to work with mice that have specific combinations of genes and to determine how they contribute to particular behaviors. Some of the first genetic candidates were identified in related syndromes in which a subset of individuals has autism. For example, approximately 30 percent of children with fragile X syndrome show features of autism. What differences — genetic or environmental — does this 30 percent carry that contribute to the autism phenotype? To address whether background-specific genetic differences can alter the effects of a single gene, Richard Paylor, professor of molecular and human genetics at Baylor College of Medicine, crossed mice lacking FMR1 — the gene primarily responsible for fragile X syndrome — with six different inbred strains and assayed autism-related behaviors. Only one mouse line — derived by crossing the C57BL/6J and DBA/2J (B6.D2 F1 hybrid) strains — has social and communication deficits and shows repetitive behaviors. Perhaps even more interesting is the fact that genetic background dictates the behavior of each of the hybrid lines, indicating that researchers should carefully select the background of a mouse model of autism and take it into account when interpreting results. Paylor also described a mouse model characterized by his team that resulted from a random mutation in a region of the X chromosome that does not code for protein. This mouse line, called MALTT, is less social, has few ultrasonic vocalizations during juvenile social interactions, spins repetitively in circles, is hypersensitive to non-painful touch, and processes sensory information abnormally. Paylor’s team identified a nearby gene, FAM46D, which is a novel gene of unknown function but may be important in cell signaling, and is expressed at a much higher level in the mutant mice. The model is a reminder that genetic variants — including single nucleotide polymorphisms and copy number variations — in regions that don’t code for genes may provide real insights into the genetic basis of autism, although their identification and investigation will be exceedingly challenging. When a mouse model does not have autism-like behaviors, is it because the field lacks assays to detect the relevant behaviors or because the gene is not involved? Researchers must consider both possibilities. Mouse and human genomes are not identical, and there is always the possibility of redundancy — that the mouse has genes that compensate for the mutation, but humans do not. Bolivar is also investigating whether the environment within the womb and the regulated silencing of certain genes — called imprinting — could affect the behavior of a genetic mouse model. Threadgill presented data showing that how the mice are housed — for example, whether they are isolated or kept in groups — and enrichment with toys can affect the outcome of social behavior and activity tests. It is also possible that a model could have a non-behavioral biomarker that correlates with autism. Researchers could use these biomarkers in mice to test potential therapies. Mouse models could also help identify predictive characteristics of autism — called endophenotypes. 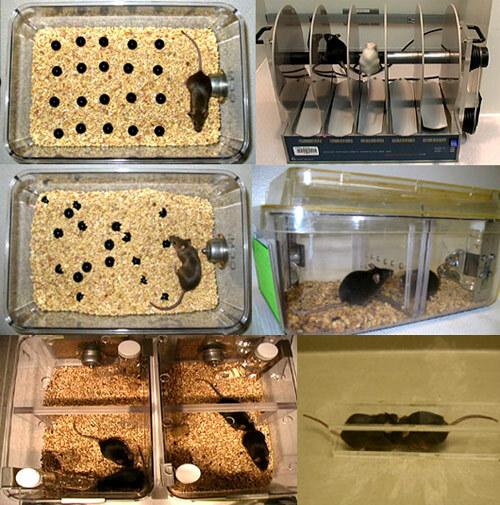 One technique for identifying endophenotypes in autism mouse models is a technologically advanced housing cage for mice, designed by Tecott. This cage automatically tracks the amount and timing of feeding and physical activity, and can be configured to add other measurements. Tecott’s experiments have shown so far that 16 different mouse strains each have distinct lifestyle patterns. Studying mice in their home environment also lowers the stress mice experience when researchers handle them, allowing them to distinguish an animal’s innate anxiety from that caused by the experiment. The cage could also help limit variability across laboratories, a persistent concern in mouse behavior research. At present, the method has limited use for autism research: the cage only allows for studying one mouse at a time. Adding an adjacent compartment for a second mouse, and the capability to track and distinguish between two mice at the same time, would make it possible to study social interactions. Still, studying overall behavior patterns could help identify traits specific to mouse models of autism. To use mouse models to validate aspects of autism in people, researchers need to identify simple, informative and high-volume assays. They should also develop methods that can distinguish what drives mouse behavior — for example, whether mice don’t engage in social behavior because they actively avoid it, or are uninterested. Executive-type functions, such as decision-making, should also be studied, perhaps using experiments such as set-shifting — which assays for the ability to detect and to switch to different patterns. Using genetically defined strains — such as the Collaborative Cross Line, described by Threadgill — for future autism mouse models would be one way to lower variability across experiments. Researchers must also prioritize the identification and validation of biomarkers in autism mouse models that could be translated to people, including behaviors, imaging measurements and screens for biochemical changes in the brain. Finally, there is the perennial question: Go broad or go deep? Should the field survey as many models as possible and try to find commonalities between them? Or should it select the most promising models and evaluate them thoroughly and uniformly? At the workshop, the consensus leaned toward deep analysis of the most promising autism candidate genes, but with the understanding that future interaction with the clinical field would be important. The workshop participants also encouraged the field to invest in multiple hypotheses, public-private partnerships for evaluating therapies, stringent controls, systematic phenotyping and research based on replicable results. 2.Crawley, J. (2000). What’s wrong with my mouse? Behavioral phenotyping of transgenic and knockout mice. New York: Wiley-Liss.